Posted on October 17, 2017 . 20 Comments. I am happy to announce a partnership between two complimentary systems—StrongFirst and Flexible Steel. Flexible Steel is a mobility/flexibility program that does not sacrifice strength for mobility or mobility for strength. We all know people who have tremendous flexibility and can tie themselves in some incredible knots, but they do not possess even a mediocre level of strength and power. On the other extreme is the muscle-bound guy who can deadlift a house, but lacks the mobility to scratch his back or tie his shoes. Either example is out of balance and not very healthy. We do not want to sacrifice one attribute for another, but instead strive for a balance of strength and flexibility. Pavel says, “Strength that does not reach is wasted…weak.” I say you can have your cake and eat it, too. Do not settle for one or the other, but train to attain that seemingly superhuman balance of strong and supple. The idea for Flexible Steel was born from a closing remark Pavel Tsatsouline said in a workshop known as Hardstyle Ventura: “A worthy goal would be to strictly press a kettlebell equal to half your bodyweight and achieve the splits. Strength and flexibility at the same time.” This comment rang so true to me. After a lifetime of martial arts competition and study, I was on my own journey to discover a better way to improve my flexibility and resilience. I was lucky to be able to travel and learn from many experts, gurus, and grandmasters. From Pavel Tsatsouline’s principles, Gray Cook’s correctives, Patrice Remarck’s routines, Bill “Superfoot” Wallace, Great Grandmaster Moo Yong Yun, and many more. I owe much to these men. 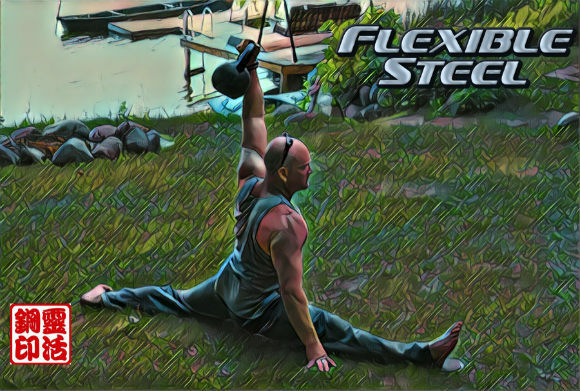 The Flexible Steel system is the product of this study—25 years of collecting bits and bobs of flexibility and strength tips, techniques from many different sources as well as my own discoveries. I have always been of the mindset that if I can learn one new thing at a workshop, course, or certification, then it was time and money well spent. With Flexible Steel, I have boiled down and systematized all these useful keepers into one well thought-out, easy-to-follow, foolproof plan to give you and your students measurable results. How Does Flexible Steel Fit? The important thing to understand is that Flexible Steel is not competing with other strength and movement systems, rather it honors and compliments them. “FMS takes care of ‘cleaning’ the natural movement patterns by revealing and eliminating asymmetries and restrictions. StrongFirst takes care of reinforcing the natural movement patterns by using hard style (conscious and voluntary renouncement of all form of compensation while executing the given movement, whatever the load). StrongFirst challenges the natural movement patterns with load, speed, and fatigue (repetitions). GFM takes care of integrating the natural movement patterns into the general movement. GFM challenges the natural movement patterns with complexity and necessary coordination. Flexible Steel is a necessary and valuable piece of the training puzzle, a piece people are frequently missing. Imagine the joy of owning the effortless flexibility of a child, while also possessing the strength of an adult. This is the Flexible Steel promise. You do not need to be super flexible or already training to do the splits to benefit from Flexible Steel. Often, we hear of people who think they are too tight or inflexible to even attend a Flexible Steel event. On the contrary, these are exactly the people who benefit the most—and not only in the flexibility department. Let’s take Granville Mayer as an example. Granville is a StrongFirst Team Leader. He is an extraordinary athlete and coach, and he is strong as an ox. When he first attended the Flexible Steel Certification, we had him take a baseline test of his military press. If I remember correctly, he pressed the 48kg kettlebell—also known as The Beast—for twelve reps. Then, we took him through the Flexible Steel shoulder program and retested his press. On that second set, he pressed the Beast for fourteen reps, only five minutes after his first attempt. That’s Flexible Steel at work. Flexible Steel will improve your kettlebell practice. Flexible Steel will improve your barbell practice. Flexible Steel will improve your bodyweight practice. The results may sound to good to be true. So, let’s try an experiment together in order for you to see the power of Flexible Steel for yourself. The Exorcist: Who Needs Rotation? The answer to that question is: anyone who plays a sport that demands rotational power and mobility. Do you practice golf, tennis, baseball, or the martial arts? What would an extra twelve inches of twist do for the enjoyment and performance of your game? Even beyond those sports, I can’t think of a single person who would not benefit from this extra freedom of rotational movement. That’s even if the closest you come to playing a sport is being a soccer mom driving your kids around. Because this one sequence could actually save your life and the lives of your kids. Ever have a close call while driving because you lacked the mobility to comfortably look over your shoulder for oncoming traffic? Say goodbye to that problem forever. You will virtually have eyes in the back of your head after adding three simple steps. Stand erect with your feet flat on the ground. Lock your knees do not bend them through out the rest of this drill. Without moving your feet, rotate your upper body as far as you can to the right. When you have achieved your greatest rotation, pick out an object with your eyes and memorize it. Contract your left glute or cheek, not the ones on your face either. I mean really contract it to the point of cramping. At the same time, try to drive your left heel through the ground. Create an indentation when you are done. I want you to imagine that the front of your left hip, kind of where your pocket would be, getting longer. If you followed the directions, you should easily add six to seven inches to your previous score. Imagine you are being hoisted into the air by your neck. In other words, try to get as tall and elongated as possible. Visualize space being made between each of your vertebra. Starting at your tailbone, in your mind, sequentially rotate each vertebra, working your way up from your tailbone to the top of your head. When you get as far as you possibly can, I want you to rotate seven more imaginary vertebrae as if your backbone extends above your head. Now, how far can you rotate? 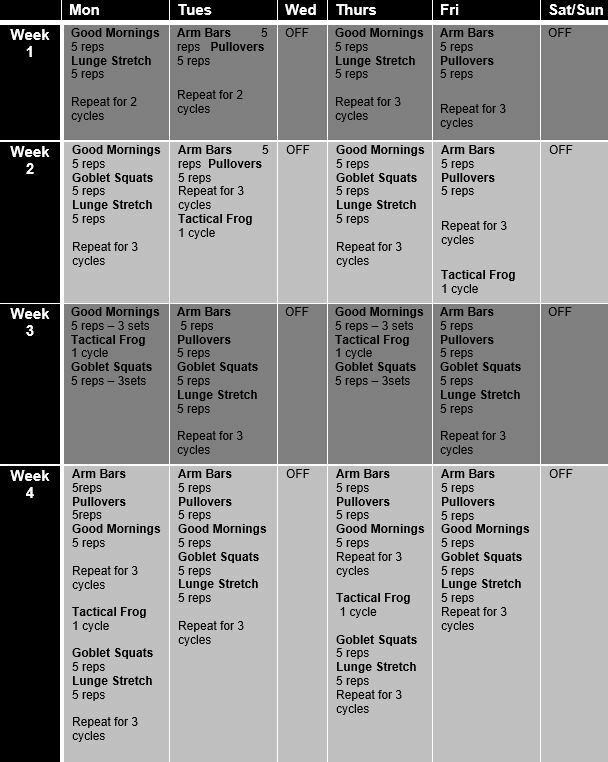 Check out where your starting point was and where your new max is. Like other great systems, Flexible Steel is scalable. It benefits the most entry-level student, the executive that wants to regain mobility to improve his or her quality of life…to the most advanced life long physical culturalist. Below is a sample beginner program with which we have had great success. I wrestled with the idea of putting the Flexible Steel 5 in this blog because I did not want to scare people off or have them dismiss the following as stunts, but in the end I include them because I feel it is important for people to see our “blackbelt” skills. All the below moves are high-level techniques that require both strength and flexibility. Please, understand these are our flagship, end-range movements, but inside Flexible Steel we have progressions for each that will allow even the most inflexible student to safely begin training at his or her current level. The move that started it all. Get into a front split or martial arts split and press a kettlebell. Gold standard weight: men 32kg, women 20kg. Introduced into the system by Jon Engum. Very challenging combination movement that includes a pike, straddle, and cobra, and the reverse of these moves. Introduced into the system by Patrice Remarck. Front split switches done between boxes using as much leg strength to rise up as possible. Introduced to the system by Jon Engum. Front split combined with a push-up. Introduced to the system by Andżelika Stefańska. Part armbar, part get-up, and part frog. Inspired by Mike Perry’s get-up variation, developed by Jon Engum and Louka Kurcer. At Flexible Steel, we offer two levels, starting with a one-day Level 1 Instructor Certification were you get the basics and Flexible Steel formulas for instant results. Level 2 Instructor Certification is for instructors who want to study the system in more depth and gain advanced techniques and coaching strategies. This level has a case study test requirement and already being a Level 1 instructor is a prerequisite. Beyond Level 2, we have a handpicked leadership team called Flexible Steel Instructor Specialists. 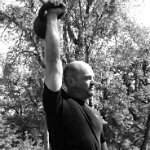 These extraordinary coaches are all kettlebell experts with an FMS background, and most have mastery level in martial arts. In addition, they receive extensive training and help to further hone the Flexible Steel system. Dr. Ricardo Nieves is our medical advisor and Fabio Zonin is the European Director. For more information about Flexible Steel visit our website or look us up on Facebook. Any current SFG, SFB, or SFL Certified instructor qualifies for a 10% discount on his or her first Flexible Steel instructor certification. Any current Flexible Steel certified instructor who has never attended a StrongFirst Certification qualifies for a 10% discount on the first StrongFirst Certification he or she attends. The discount is effective at the date of this publication. Jon Engum is a Master SFG Instructor and a 7th Dan Kukkiwon Certified Grandmaster. Engum is the author of Flexible Steel, Creator, Chief Instructor of the Flexible Steel System, owner of Engum’s Academy, Engum’s Taekwondo Association, Jon Engum’s Extreme Training and is a Vice President of the Minnesota Taekwondo Association. He has presented and lectured on several continents and teaches Workshops, Courses and Instructor Certifications worldwide. What does one cycle mean for the tactical frog? Everett a cycle of the the tactical frog can be as easy as 10 prying movements back and forth or as long as the series in the FS book. Play it by ear. Stop your set when you are feeling you are no longer making progress. Thank you for clarifying Jon! On your website, when trying to find an instructor, it narrows it down to United States. Rather large area. When I click on the instructors, not enough info to know their location. Maybe it is my browser, or maybe I am looking in wrong part of website, but it would be nice to be able to find an instructor in my area quickly and easily. Dan, there is a zip code search on the StrongFirst website. Hmmm….not seeing ‘Flexible Steel Cert’ in search choices. Am I missing something? Dan, sorry, that is a different company altogether. You’ll have to visit that website. However, Pavel Tsatsouline has always been a flexibility expert as much as anything else, maybe even before anything else. Yet on the forums, when people discuss Simple and Sinister, they don’t usually discuss the stretches. When would StrongFirst offer a mobility option, I wondered? StrongFirst does not mean strong only! Here is the answer, and that is great. Very cool! Wasn’t able to attend the Seattle event last time (I was out of town) but this has motivated me to seek it out for sure. SFG + GFM has been game changing for me, so looking forward to learning more. Also, the link to the instructor certification is broken. Congratulations, Jon! And thank you for the credit! I am so happy for you and for this collaboration. Looking forward to seeing you in Korea next fall for the SFG carts and I promise to make it to an FS cert as soon as possible to spread the word in Japan. Typo. Of course I meant SFG certs. Autocorrect. Thank you and thank you to Pavel for the support!